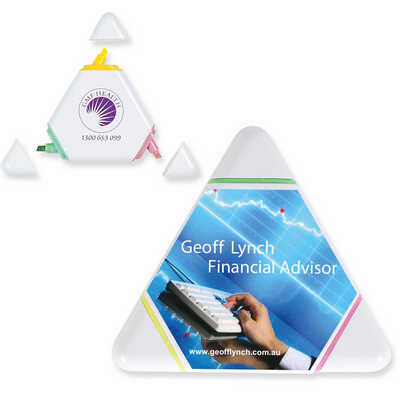 White triangular case features 3 chisel edge fluorescent highlighter markers in green, pink and yellow. Colours - White Size - 90 x 90 x 12mm (LxWxD) Decoration Area(s) - Pad Print : Front/Back - Circle 40mm Dia. ; 4CP Digital Direct Print : Front/Back - 63 x 53mm (LxH) to follow curve of product (refer line drawing). Price includes : 1 Col 1 Pos Print. Setup is included.